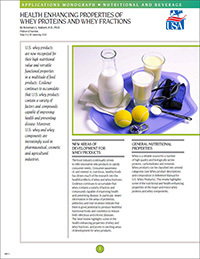 An 8-page monograph designed to educate users of whey products in nutritional and beverage applications. Includes complete information on: new areas of development for whey products, general nutritional properties, the composition of milk proteins, bioactive whey proteins and peptides, calcium and other minerals in whey, and on probiotics and prebiotics. Also available for free download in Chinese (Simplified) │Portuguese│ Vietnamese.